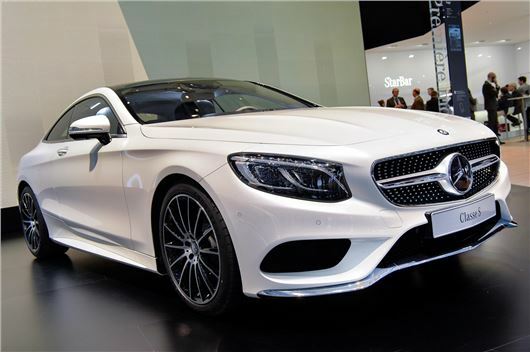 The Mercedes-Benz S-Class Coupe went a long way towards stealing the show at Geneva. Its mixture of high technlogy, tilting suspension and some over the top interior and exterior detailing, guaranteed huge interest, but the real significance is when these new technologies will appear on more sensibly priced cars. It's a big visual leap from the outgoing CL-Class and features a domed roof and heavily sculpted flanks. Some may say that the optionally available expressive headlamps, each featuring 47 Swarovski crystals, might be a step too far. The interior is even more luxurious than before, with a swooping dashboard and four individually contoured seats. The central controls have all been updated, while there's now an optional laptop-style touchpad in the centre armrest and a larger screen. The optional head-up display is now in full-colour and offers a number of options. Undoubtedly, its Magic Body Control system is the main talking point - and it's described as being the first production car to incorporate this technology. The idea is a simple one - the car leans into bends by up to 2.5 degrees much like a motorcyclist, thereby reducing the lateral acceleration acting on the vehicle's occupants. Although several manufacturers have worked on similar systems, right back to the 1980s, most could not get it to work reliably, or felt that it was something that buyers really wanted. Mercedes-Benz now clearly feels they are - and are offering it as a switchable system that works between 20mph and 110mph. Other technology as part of this 'Intelligent drive system' includes a road scanner, which uses the a camera mounted within the windscreen to alter the ride and damper settings depending on the surfaces it sees ahead. There are also Pre-safe, Distronic Plus with Steering Assist, Active Lane Keeping Assist, Active High Beam Assist Plus, Night View Assist Plus and Collision Prevention Plus system. The S-Class Coupe will be offered with one engine from launch, the twin-turbo 4663cc V8 petrol used in the outgoing the CL. There are detailed changes, which see the power output raised to 455PS and torque up to 700Nm. The sound will be enhanced by the twin-pipe sports exhaust system, which incorporates pneumatically actuated flaps, that free gas flow. Performance will be largely similar to the existing CL and limited to a maximum speed of 155mph. Prices have not been confirmed, but expect it to be around £100,000, with a very long options list.